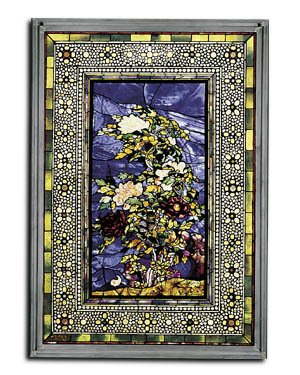 Dimensions: 9 3/4" x 13 3/4"
The Peonies Blown in the Wind stained glass tableau was reproduced from the original in the Museum of Fine Arts, Boston. Commissioned in 1886 by Sir Lawrence Alma-Tadema for his studio in London, this tableau is an excellent example of LaFarge's trend towards color abstraction. LaFarge is not an artist whose aims are easily understood by contemporary scholars. Now, as before, some understand him as an innovator with a radical approach to design and layout. Others believe he sought a compromise between experimantation and tradition. Somewhere in between is another aspect; LaFarge's desire to escape - his fantasies were created through color and light. Often his escapes carried him to foreign lands. Peonies, for example, unites the Oriental design with sensuous Western Impressionism.